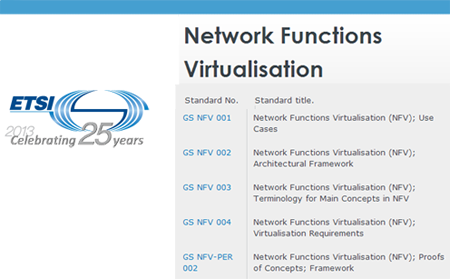 ETSI published the first five specifications on Network Functions Virtualisation (NFV), which aims to simplify the roll-out of new network services, reduce deployment and operational costs and encourage innovation. These new specifications were produced in less than 10 months. ETSI’s Industry Specification Group for Network Functions Virtualisation (NFV ISG) said this first release identifies a framework and terminology for NFV that will help the industry to channel its efforts towards fully interoperable NFV solutions. Early NFV deployments are already underway and are expected to accelerate during 2014-15. The five published documents include four ETSI Group Specifications (GSs) designed to align understanding about NFV across the industry. They cover NFV use cases, requirements, the architectural framework, and terminology. The fifth GS defines a framework for co-ordinating and promoting public demonstrations of Proof of Concept (PoC) platforms illustrating key aspects of NFV. Its objective is to encourage the development of an open ecosystem by integrating components from different players. “These publications provide important guidance to the industry on the requirements that should be the basis for future development of NFV technology. ETSI’s openness to all players means that we have been able to involve everyone and reach a broad consensus. The documents, and the PoC framework in particular, send a strong message that we want to encourage multi-party interoperability and the growth of an open ecosystem." “We have been especially concerned not to impede progress with a protracted standardisation effort in NFV ISG. As a result, these initial specifications have been developed in record time – under 10 months of intensive work. This is a major achievement for the industry. We hope to maintain this momentum and produce additional guidance soon." Work is continuing in NFV ISG to develop further guidance to industry, and more detailed specifications are scheduled for 2014. In addition, to avoid the duplication of effort and to minimise fragmentation amongst multiple standards development organisations, NFV ISG is undertaking a gap analysis to identify what additional work needs to be done, and which bodies are best placed to do it. The published documents are available online. CenturyLink activated its first, dedicated 100 Gbps circuit for a CenturyLink business customer through a direct connection to the company's recently upgraded 100 Gbps nationwide network. DigitalGlobe, a leading provider of commercial high-resolution earth observation and advanced geospatial solutions, will use CenturyLink's 100 Gbps Optical Wavelength Service to launch a new product allowing its customers direct access to satellite mapping data. The 100 Gbps circuit links DigitalGlobe's headquarters in Longmont, Colo., to its offsite data center, where its customers will be able to access the data remotely. "This is a significant day for the industry and for the state of Colorado. CenturyLink's deployment of commercial 100 Gbps service gives businesses bandwidth for the big data applications they need to excel," said Scott Russell, vice president and general manager for CenturyLink in Denver and Northern Colorado. "Our speed and capacity upgrades provide DigitalGlobe with an end-to-end optical network that improves efficiency and productivity. Simply put, 100 Gbps is the best the industry can offer." 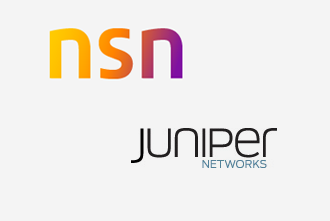 Nokia Solutions and Networks and Juniper Networks have expanded their long-term partnership to cover secure IP connectivity for high-performance mobile broadband networks. Next generation mobile backhaul: for mobile operators that need to upgrade and consolidate their backhaul networks to support LTE and LTE-Advanced architecture. Radio access security: to encrypt and firewall traffic coming into the mobile network over the LTE, as well as the 2G/3G radio access network. Mobile Site connectivity: for operators upgrading or extending their mobile infrastructure with the latest NSN products at the controller sites and at the mobile core. Carrier-grade NAT: for operators facing exhaustion of public IPv4 addresses and planning for IPv6 migration. NTT Communications Corporation (NTT Com) will provide Yamaha Motor Co. with a cloud platform to operate mission-critical systems in Japan for production, procurement, product development, human resources and finance operations. NTT Com will deploy its Enterprise Cloud global cloud service and Arcstar Universal One global network service to create a highly robust and scalable cloud platform. Yamaha Motor will use the platform to strengthen business continuity and slash ICT costs by consolidating currently dispersed servers, networks and other ICT systems on to NTT Com cloud services. Yamaha Motor plans to migrate all ICT systems in Japan by 2018. ICT systems overseas will be migrated within an appropriate timeframe. Yamaha Motor’s mission-critical systems encompass some 700 servers and are accessed by their group companies worldwide. Most of the systems are owned and operated at on-premise environments within the Tokai region of central Japan. NTT Com’s cloud platform with its many data center helps lower the disaster risk and improve business continuity. Yamaha Motor operates 140 group companies in 30 countries/regions and generates about 90% of total sales overseas. GigOptix has become the sole long reach (LR) transimpedance amplifier (TIA) supplier for one of the largest suppliers for fast growing 40 Gbps QSFP+ LR transceivers. GigOptix said this new supply partnership is with one of the world's largest suppliers of optical communication components and subsystems. Financial terms were not disclosed. 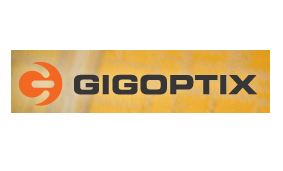 "GigOptix is pleased to now become the sole independent 40 Gbps LR TIA production supplier to one of the world's largest suppliers of optical communication components and subsystems. This new supply agreement reaffirms our position as the leading industry merchant provider of TIAs to the heavily deployed 40 Gbps QSFP+ LR transceiver market. We have been working very hard to support our partners in delivering quality systems to the market as fast as possible. This hard work has produced an outstanding production shipment volume and has put GigOptix into a leading position in many applications including LR TIAs for transceiver applications," said Dr. Raluca Dinu, General Manager and Vice President of the Optics Product Line at GigOptix. CommScope completed an initial public offering of 38,461,537 shares of its common stock. The anticipated initial offering price is between $18.00 and $21.00 per share.